Are you also investing in Tesla? Discussion in 'Tesla, Inc.' started by Fr23shjive, Nov 4, 2010. I know we have a bunch of Tesla enthusiasts on here but are you guys also putting your money in the company so that when/if it becomes the #1 car company you'll be cashing in too. So are you investing in Tesla and where do you think this stock will be in 3 years? Today there was an increase in stock price of a little over 14%. Not bad for a day. One of the best days in weeks. No telling about tomorrow, but sooner or later, people are going to "get it" and jump on the bandwagon while the jumping is good. Tesla is going where no car has gone before, and you know they will make it. Of course, I invested. I support the concept of electrics, I know we are in exit mode on cheap energy, and if all else fails and Tesla folds and you lose your money, you know the banks will not be far behind and you'd lose it anyway. In the interim, I'd rather Tesla has it than the banks. 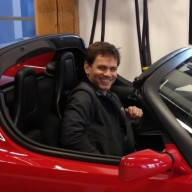 As a Roadster owner, I was offered the opportunity to buy 500 "friends and family" shares at the IPO price. I did buy them. I don't have a feel for the proportion of owners who took advantage of that offer. Today there was an increase in stock price of a little over 14%. Not bad for a day. One of the best days in weeks. Maybe so, TEG, but there was no similar jump when Toyota jumped in, NUMMI was finalized, or when Mercedes bought in. I think it's just the snowball slowly rolling, collecting more speed and size. People are beginning to know "Tesla", what they do, about the car. Some people. Just today a Dr. asked me if I had invested in Tesla. Of course! And so had he. And it wasn't because of the battery deal. Conference call at 2pm PT. Are you guys tuning in? Should be interesting to hear where they're at and if every thing is on schedule for 2012. Elon mentioned that the model s is still on schedule. Listening to it now. I don't listen to many earnings reports so this is interesting. He did say 'mid 2012 with a ramp up in production in the last half of 2012' (this is from memory so may not be exactly correct). This would seem to indicate it's been pushed back from early 2012 I was told months ago for Signature reservation holders but consistent with what they've said recently. Yeah, that’s what I remember also. As long as it doesn’t get pushed back anymore then it shouldn’t be too much of a problem but with them losing $30 million a quarter they can’t afford too many more delays. One thing that I’m really interested in is how much they'll be making off of each Model S and how many they need to sell in order to operate comfortably. I know they said their first year goal is 20k but I’m curious to know where that positions them if they achieve that goal. Personally I think they'll be able to crush the 20k goal. If people are even half as enthusiastic about the cars as I am they'll be selling like hot cakes. Hrm, I heard 80 KW direct-DC charging available at time of launch. Wasn't clear if it was proprietary. The default Model S pack is 70 KWh and estimated charge time is 45 minutes from near-empty to near-full. I'm not sure that TM will ever officially disclose this...think about the ICE world for a moment...does any car manufacturer ever disclose their profit margin on a per model basis? I can't see how disclosing their profit margin / model would be beneficial to TM in any way. My question is who will deploy these? If they only work with the Model S and Tesla deploys these, I don't think there will be enough of them. If they somehow use the J1772 connector that can be used with the Leaf and other upcoming cars, it may work better. So it looks like the Roadster has a "profit-margin" of 17%, at least as they have accounted for costs. Of course it is way more complicated than that, as some portion of costs in "sales, general and administrative" are going to be directly connected to those sales, but it was interesting to see that number when I read the earnings report. BTW Jaff -- someone in Seattle is getting a white sport (sitting in the store the last two day). It looks REALLY good. I'm assuming based on your picture that yours will be white. That was my second choice color, but I thought it needed the carbon fiber body package to look best, and couldn't justify the added expense. It looks great in all white it turns out. I'm going to love the radient red. It may be the most common color, but Roadster's are so uncommon anyway! Yes, without the CF accents, the white loses some of its appeal to me as well...agree, the Roadster is an eye-catcher in any colour configuration imo. Shares jumped approx 20% today on lower than expected losses. Imagine how the stock is going to perform once they actually start selling the Model S.
Fun decisions to have to make! (on color). I didn't meant to sound like I was disagreeing with you.... I don't think manufacturers disclose profit margins on models. It just so happens that with only one model it looks like we can infer some of the numbers for now (and since the company is public). I probably should have replied to Fr23shjive's post . Just got home, called up TSLA stock quote. No new buy ins from Panasonic, or auto makers. Stock jumped second time this week, another 15%. Hope you all have TSLA stock. I went through the same decision between fusion or Radiant Red or white. The car looks amazing in Red but decided to get the white with CF too. Glad it looks cool as well. Either way, it's still a Tesla Roadster so I'm sure I'll be happy. Waiting for delivery is tough!